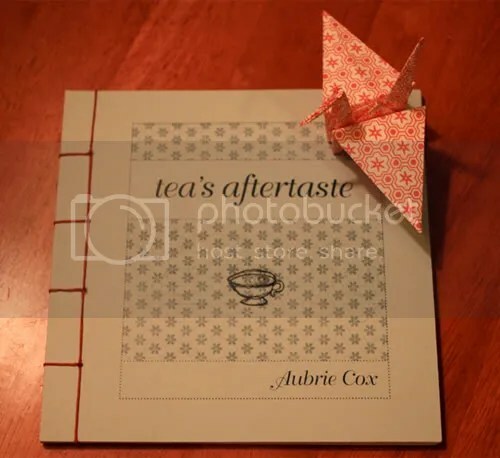 But in more immediate news, yesterday was the release day of my first chapbook collection tea’s aftertaste. Published by Bronze Man Books (same publisher as the Millikin University Haiku Anthology), it is now available through the website for $12 (plus $2.50 for postage), or if you’re in the area, at Blue Connection in downtown Decatur. Each book is hand-sewn with a Japanese side stitch, and was designed and illustrated by Katie Baird. Before I get into the sewing and whatnot, I have to talk about the illustrations a bit. And the lettering, yes, the lettering. Katie painstakingly went through and wrote all the poems by hand. I’m still in awe of her ability to keep the spacing between her letters and her lines as even as possible so each word is legible. When we were trying to decide on artwork for the book, Katie’s playful pencil sketches caught my eye immediately. The majority of the book’s pages contain illustrations inspired by the haiku, and for the collector’s edition (available next week for $25), she’s gone through and colored the sketches with white and gold pencil. You can see an example of a page from the collector’s edition (top) and from the regular edition (bottom) here. For the binding, as said, we used a Japanese side stitch with red waxed linen thread. It took about two sessions of sewing, one of which I was able to take some photos of (see here). It was quite a bit of fun to teach folks how to do the binding, and by the second day, when we had more people, they were able to pass on the instruction. I’m happy to report we had minimal needle-stabbing of fingers during both sessions. One thing I knew for certain when I took my manuscript to Bronze Man Books was that they would treat my collection with individualized care and do all they could to make it a unique publication. It reflects both the author’s and the content’s personality, while holding up to the high quality standards of the company. If you buy a copy (which I certainly hope you do! ), please know all profits go directly into the company, which then allows this student-run press to keep going and to offer students hands-on experience in design, editing, and other aspects of publishing. And, of course, please enjoy my humble poems.